You could say that You Rang M'Lord was born out of the other 3 series, considering that a lot of the cast had featured in them. In 1988, Hi-De-Hi had come to it's emotional conclusion after 9 series and 8 years. You Rang M'Lord was to be the last series penned by Jimmy and David together. Jimmy's grandfather had been in service as a butler, and his father had told Jimmy a lot of stories of things that had happened "below stairs". David's mum Anne Croft had been a musical comedy star in the roaring twenties and so knew about a lot of the behaviour "above stairs". David was very keen to try out a 50 minute episode duration, which he felt would give them the opportunity to develop characters and situations more thoroughly. Gareth Gwenlan, head of BBC comedy said he would back it to the hilt. The pilot episode was due to be recorded at Television Centre, but at the time the BBC was plagued by strikes and walk-outs. Only the hall set had been erected. 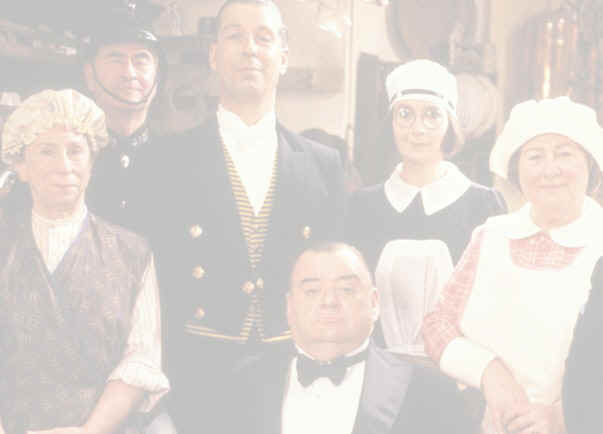 The dining room, drawing room and kitchen sets had to be erected very quickly, and were very sparsely dressed, but despite all these problems the show was commissioned for a series, which was first broadcast in 1990. It stars Bill Pertwee, Frank Williams and Brenda Cowling all from Dads Army, Michael Knowles and Donald Hewlett from It Ain't Half Hot Mum and Paul Shane, Jeffrey Holland and Su Pollard from Hi-De-Hi! Other stars from the other series also make occasional appearances such as Felix Bowness, Stuart McGugan and Barry Howard. Susie Brann played the spoilt, catty Miss Poppy and Catherine Rabett played the cross-dressing Miss Cissy. This time the theme was written by Jimmy and Roy Moore . It was performed by Paul Shane and the late, great Bob Monkhouse whose vocals suit the period perfectly.